The snare drum is a drummer's most prized drum among all the drums in the drumset. If anything besides drumsticks, a drummer on a tour using the venues' drums will pack cymbals, a snare and a bass pedal. For over a century, that snare is frequently made of metal. What makes metal snares so special? Ferro-Manganese, Copper, Aluminum, Steel, "2002" Alloy, Titanium, Phosphor Bronze, Brass and the list goes on... Is it the alloy that makes the drum? The shell size? The thickness? The hardware? The bearing edges? Like with all snares, the answer is yes--to all of it. Each of these parameters go in to making a snare's ultimate sound. The combinations and blends of these factors are nearly endless. Traditionally the most expensive snares on the market have either thick-walled shells or very thin shells. 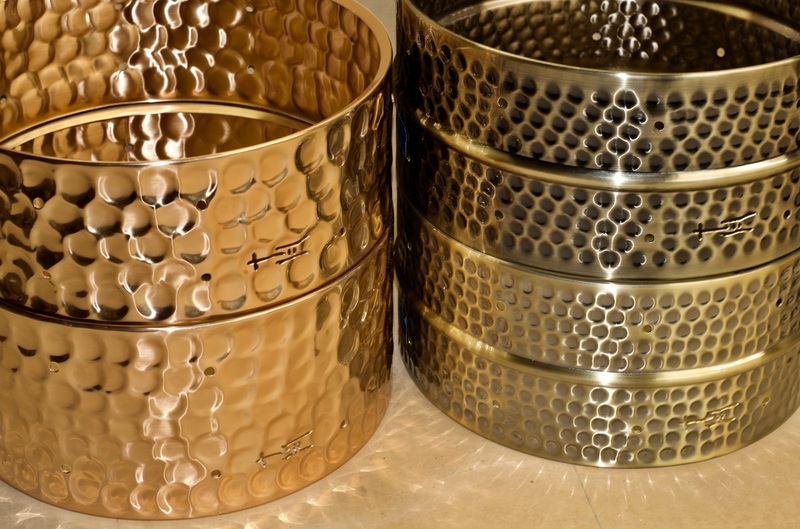 TreeHouse's offering of metal snares is founded on two very affordable and versatile materials: Hammered Brass and Hammered Bronze. The snare shell's interior makes a difference in its sound. When a snare's interior is smooth, either clearcoated wood or straight-walled metal, the column of air that shoots down from the batter head upon impact travels moderately unimpeded. This phenomenon lets the air column bounce around a bit and produces a characteristic high-pitch ring. An iconic American wooden snare from the 50s could have such a rough interior you'd get a splinter if you touched it. Like that wooden drum, a hammered metal shell has the characteristic of breaking up the column of air that moves within a drum when it's struck. This produces a warmer tone than straight-walled snares, but unlike that rough wooden drum, a hammered metal shell also sings out some of the bright tones that only metal shells can produce. This blend of warmth and projection makes TreeHouse Hammered Metal snares great all-around drums to fit all styles of music.